The year is 1348 and the first plague victim has reached English shores. Panic erupts around the country and a small band of travellers comes together to outrun the deadly disease, unaware that something far more deadly is, in fact, travelling with them. The ill-assorted company — a scarred trader in holy relics, a conjurer, two musicians, a healer and a deformed storyteller — are all concealing secrets and lies. And at their heart is the strange, cold child — Narigorm — who reads the runes. But as law and order breaks down across the country and the battle for survival becomes ever more fierce, Narigorm mercilessly compels each of her fellow travellers to reveal the truth … and each in turn is driven to a cruel and unnatural death. 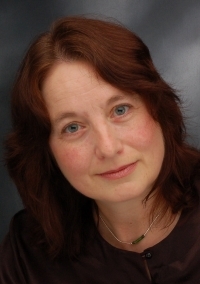 Karen Maitland (born 1956 in England) is a British author of medieval thriller fiction. Maitland has an honours degree in Human Communication and doctorate in Psycholinguistics.Her works include The White Room published in 1996by Yorkshire Art Circus, Company of Liars, published in 2008 by Delacorte Press; The Owl Killers, published in 2009 by Michael Joseph; and The Gallows’ Curse published by Penguin in 2011. She has worked as a writer and editor on a number of cross-cultural books including “Poems of Cultural Diversity” and “Cinders in the Wind”. 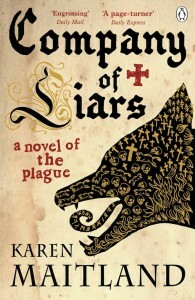 Company of Liars is available for immediate purchase via these links to Amazon.com and Amazon.de. When you make a purchase via this website, a percentage of the price goes right back into site maintenance and development. Thanks for the support! The book has a few gross flaws that — despite being an easy and engaging read — makes the book a “not to recommend” title for me. **** SPOILER ALERTS AHEAD. **** As the title suggests, the driving premise of the book is that we all tell big and small lies to survive among our life’s companions in a cruel world. While the Black Death is real in this story, the book suggests there are a world of other intangible contagions, including xenophobia, warmongering, and religious bigotry. The author does a good job of showing how these drive the characters to both “hatred of the other” and self-loathing. The young musician who lies about his homosexuality is driven to his death just like the former-priest-turned-trickster who duped his congregation into believing in miracles and then fled with precious church artifacts. The mother who — after being grossly disfigured in battle — was rejected by her family and sought solace in a life lived as a charlatan (and a male) is targeted by the witch just like the man who murdered the trickster-priest. The witch becomes, effectively, the moral arbiter of these liars. That she, presumed dead, turns up again at the story’s end makes her as laughable as any B-grade horror movie monster. This flaw, along with what many identified as poor historical research, lowered A Company of Liars from its potential as an engaging and provocative tale of the mores of Britain and survival during the Black Death to something akin to “how the Black Plague sucked and then sucked more because of a mean little witch” road tale. Too bad because it was otherwise a fun read.